A new player in the world of photo-etched sets had entered the market. This is a very active and fast growing kit manufacturer (they specialize in 1/72-scale modern Soviet/Russian armor kits) ACE from Ukraine. Matt Bittner already reviewed this company's release on I-16 and considered it as an excellent product, better than other competitors. I wish to join Matt in his evaluation and review ACE's one of the first releases dated back to 1998. By now every modeler interested in the VVS subject is aware of the ICM's excellent Tu-2 and its more affordable version by Encore (same plastic, different decals and packaging, but very different prices!). 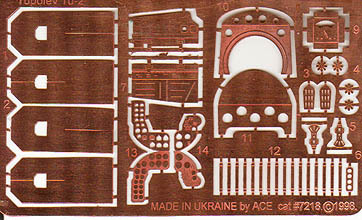 ACE released a much needed aftermarket accessory for this kit - a photo-etched set, which covers the cockpit area mainly. As could be seen from the enclosed image the details of pilot's instrument panel (unfortunately, no film with dials, but a decal could be used instead), bulkheads, pilot's side panels, and excellent pedals are included. For a gunner/radio operator a radio unit is given. Unfortunately, nothing is done for a navigator's office but this could be explained by the lack of references available at the set's release date. Also fins for two bombs are included in the set. I consider this set to be a must for a PE addict like myself. The cockpit area of the Tu-2 is a focal point of the kit and dressing it up will make the model much more attractive and realistic. I hope that ACE will continue it's excellent service for fellow aircraft modelers (hey, there are a lot of us there!) and will release more stuff for Tu-2 (what about the bomb-bay, bomb bay doors, and some external details) and other VVS models (Aleksey, think about MBR-2, there is a lot to dress up there as well!). My kudos to ACE and keep cheering us! Highly recommended: a must have for Tu-2 modelers.